It was school lunchtime when an idea was sparked for our Picnic Party game. 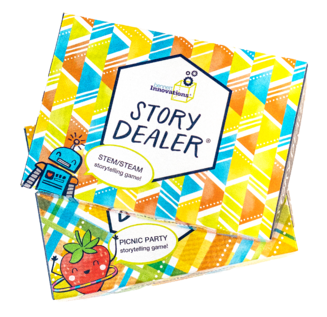 It would become the newest card game in the playful line of Story Dealer storytelling games for kids, joining our STEM/STEAM game, and the blank deck of 5Ws DIY Maker-Space cards. Since the value of children enjoying fresh food, social engagement, and laughter is well documented, Bennett Day School snacks and meals are designed as pleasantly social, family-style events. It was here that we asked ourselves: Why is it that children will leap at the chance to taste beautiful edible flower-blossoms on a salad, yet they will not try an average veggie? Was it our chef’s blend of beauty, novelty, frivolity, and fun that was drawing children in, to try new things at lunch? We wanted to create a new game for creative fun with food. 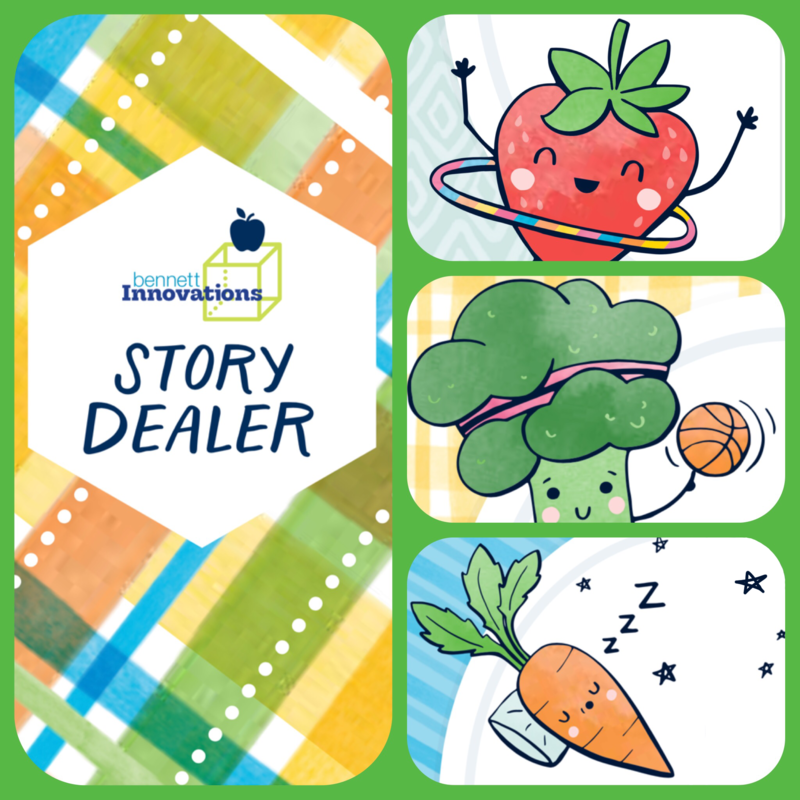 We began making the Story Dealer: Picnic Party game so kids and families could create dynamic (and silly) stories using adorably active food characters who romp, jump, skate, and hula-hoop their way across illustrated plates. As with classic Go-Fish games, our players collect matching card-types as they play. 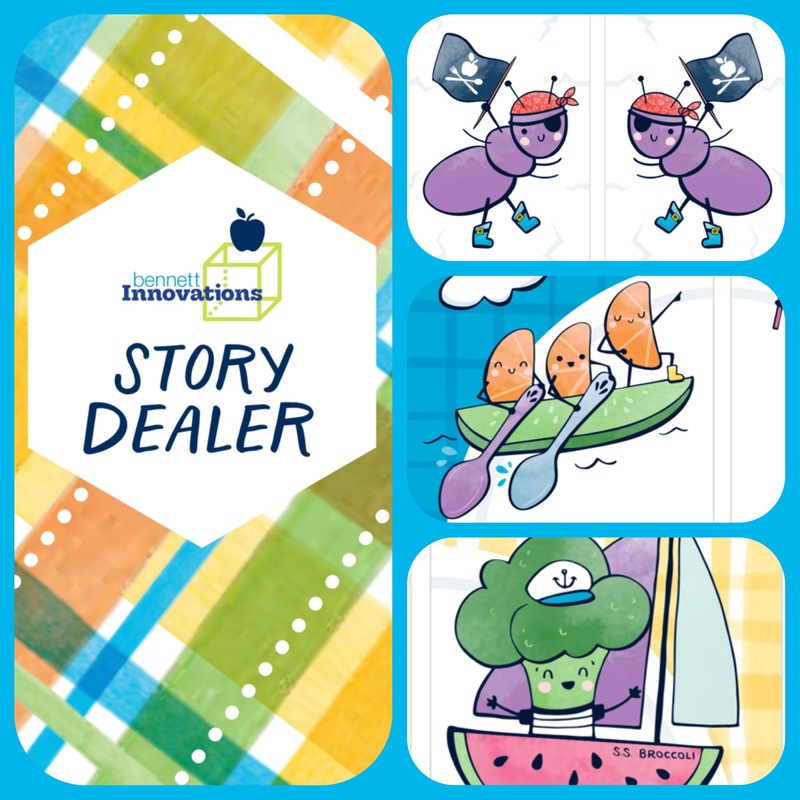 In addition to telling tales about these yummy characters, players can also use our two Pirate Picnic Ants who just might take another player’s tasty treats during a game. Argh! 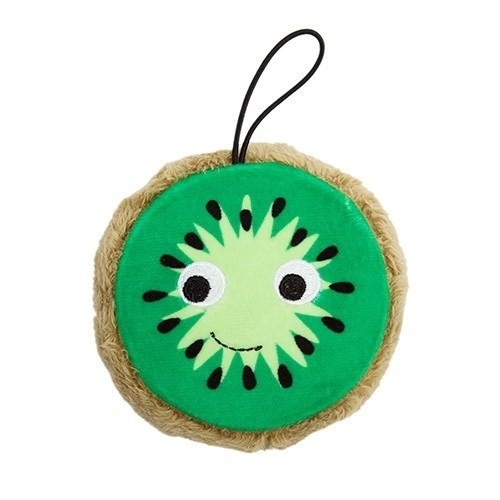 For now we hope that you will join us in watching out for fun Kawaii style toys, games, and playthings that help kiddos create friendly stories using colorful food characters. 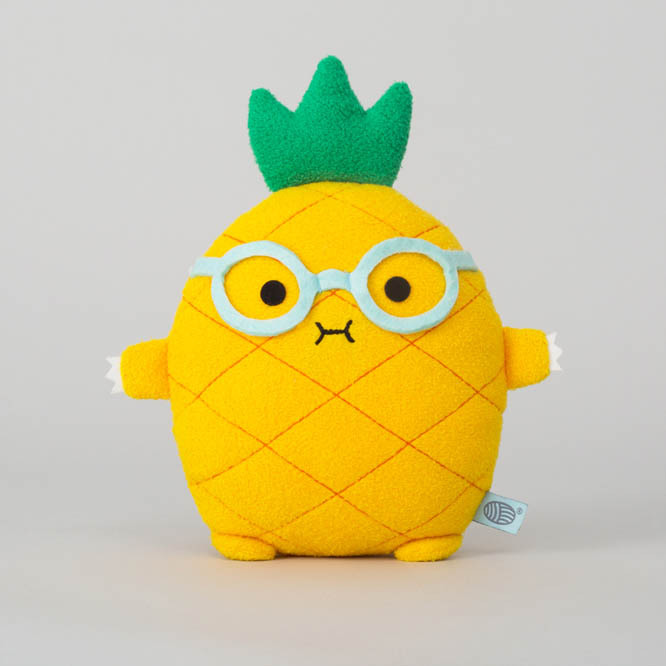 According to Noodoll company their adorable Riceananas softie is “a geeky pineapple made from soft yellow fur, and has a pair of funky blue felt eyeglasses.” At Bennett, we’re fans of their mini and cushion sizes. 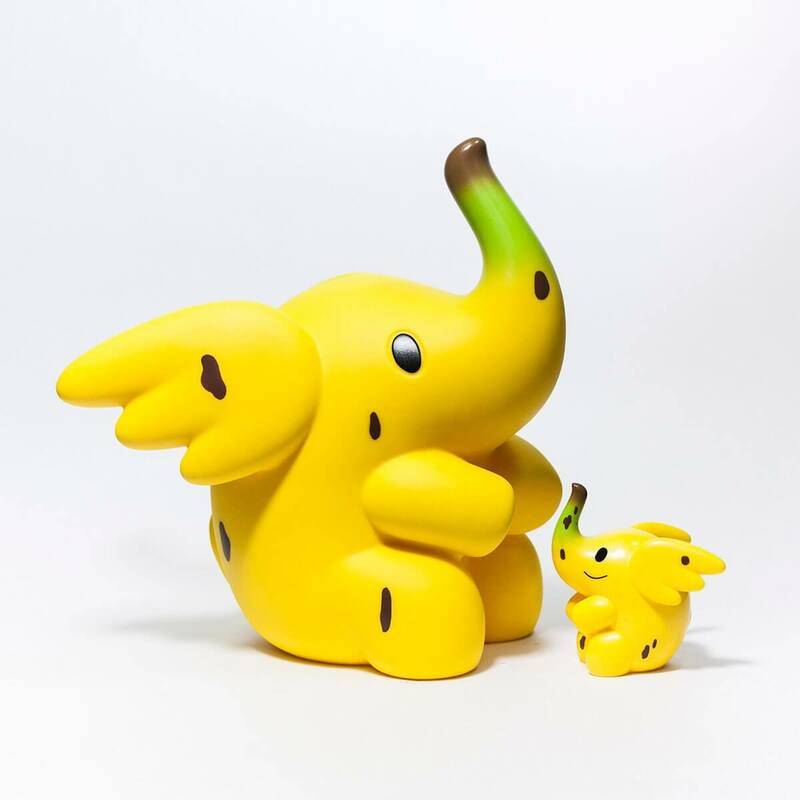 With friendly styling that’s part banana and part elephant, this next cutie is irresistible. Toy collectors have fallen in love with Banana Elfie from Unbox, as discussed in this fun piece by The Toy Chronicle. 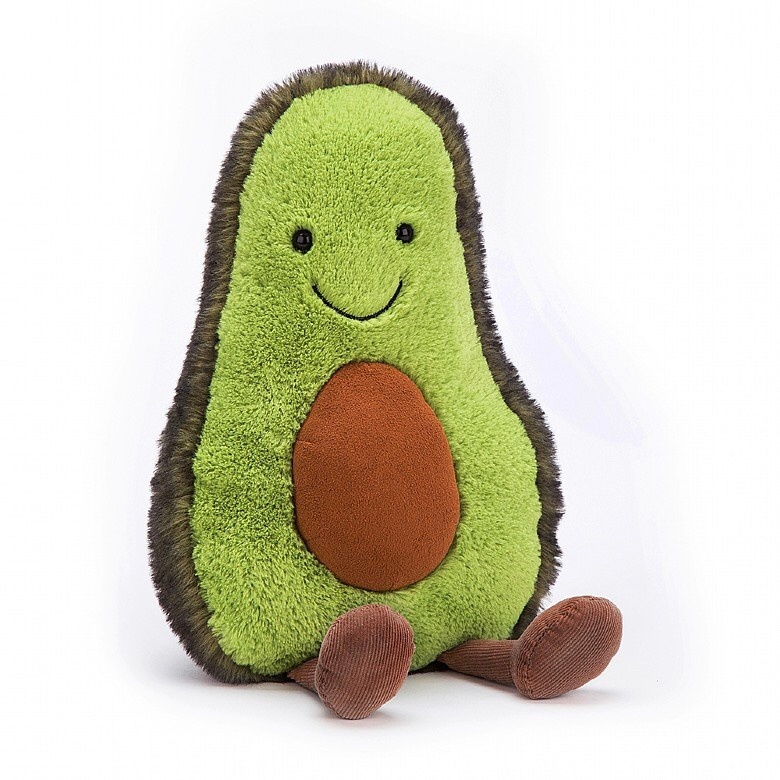 Make a fun family project and sew your own simple fruit & veggie characters. Sound fun? 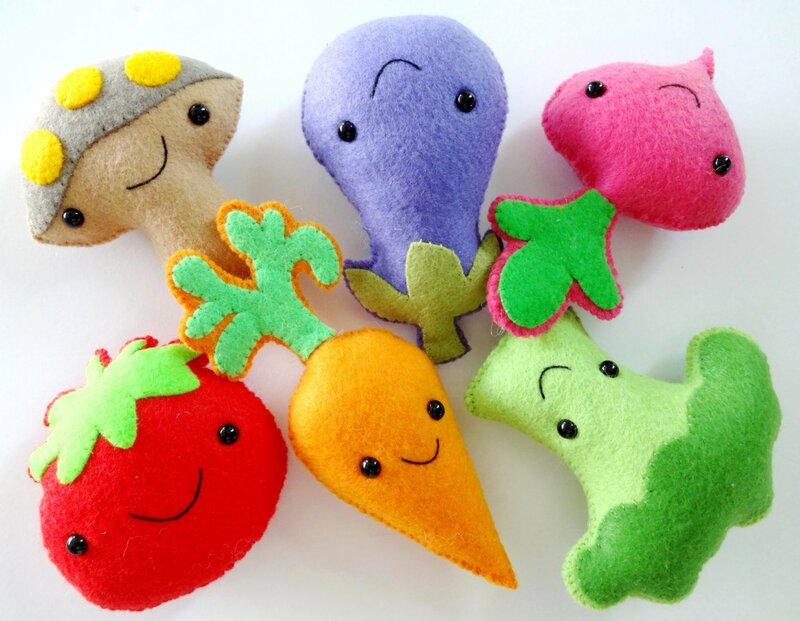 Here’s a set of super-cute Kawaii style patterned characters featuring: Tomatoes, Mushrooms, Carrots, Broccoli, Beets, and Eggplants.